The Oasis Programme at St. Luke’s has been going strong for over 12 years now. It is offered to anyone who is searching for the meaning of life, very often prompted by illness or a life crisis that makes us stop and take stock. An Oasis group can be tremendously supportive during such times, through the compassionate and mutual sharing of wisdom over a period of nine months. Meetings take place on a weekly basis for 3 hours. 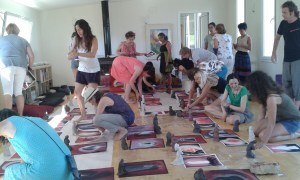 Increasingly there are requests to teach the facilitation skills required for running such groups, also from abroad. Over the last eight years I have been invited to teach such courses in Spain so that therapists can start their own groups, two of which are now active in Madrid and Barcelona. My most recent teaching assignment for a group of 30 therapists took place in a beautiful country property near to Montserrat, a 90 minute drive from Barcelona. We began the day with a silent meditative walk, each time taking a different focus – sprouting, budding and new growth; or leafing, spreading and abundance; dying, seeding and receding. As part of a team building exercise we split up into 3 groups of 10 people. 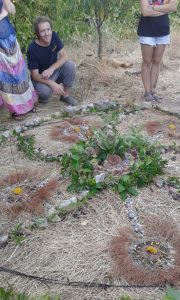 Their task was to work with nature and together create a mandala with the materials found in the surroundings. On the first day each group chose and marked out their very different locations, one very intimate and hidden, one exposed with breath taking views and one near the studios. 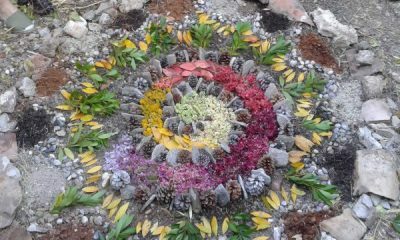 The mandalas were developed over the next three days, beginning with the structure, then focussing on enlivening and lastly on ensouling them, all the while working as a whole group. Not surprisingly, there were challenges and potential conflicts to overcome – an essential learning process to find creative ways of resolving them. There was above all, much joy and laughter, singing, chanting and dancing! To conclude and celebrate our art work we visited each place in turn and were showered with flower petals and greeted with the description of intense group processes that had been experienced, but also saw how the intricate dialogue with nature in its varied manifestations was being mirrored in our own souls. The outdoor work was complemented in the studios with art work, paintings and sculpture as well as study and reports from the budding Oasis groups in Spain! It was wonderful to witness the growing heart warmth, enthusiasm and new ideas that were being discovered to then take home and work with.